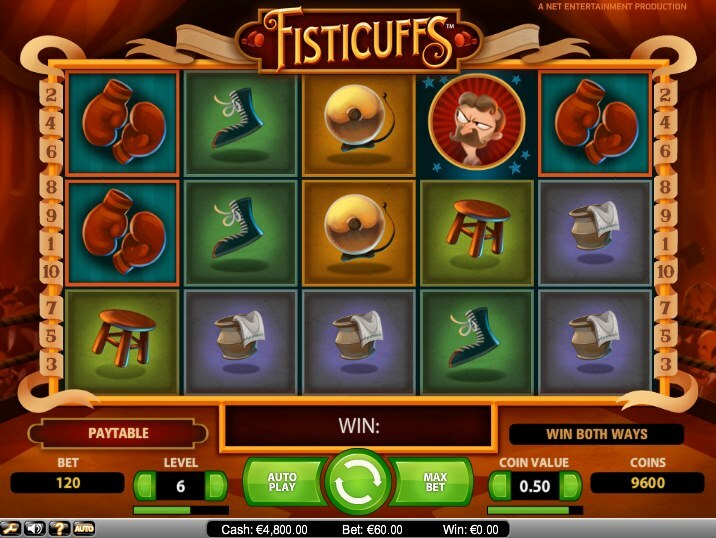 Fisticuffs is the NetEnt-developed slot game that is taking us all back to the days when gents would “stick ‘em up” and fight mano a mano with the sleeves rolled back with the bowler hats still on the head. This 5 reel, 10 pay-line slot was highly anticipated before it was released but unfortunately it has failed to live up to the hype and excitement that it generated upon its launch. Although a 10-line slot, the game plays both ways so is essentially a 20 payline game. Symbols in the game consist of the imagery you would associate with old skool underground boxing from back in the Victorian era with gloves, stools, trophies and bells making up the regular symbols. There are two Wild symbols in the form of the Moustache Boxer and the Bald Boxer with the former being the Diagonal Wild and the latter taking on the role of the Straight Wild but this is just really a Wild divided by 2 and not two separate Wilds. The Moustache Boxer Wild only appears on Reels 2 and 4 but substitutes for all other symbols to complete winning combinations. The Bald Boxer Wild appears only on the central reel and substitutes for all other symbols to complete winning combinations. The only stand-out feature in Fisticuffs is the creatively named (forgive the sarcasm) Boxing Feature. This is triggered if one or two Moustache Boxer Wilds appear on the same row as the Bald Boxer. They will then get punched to Reel 1 or 5 with all the symbols in between turning Wild. A free spin will then be awarded. Yes, just the solitary free spin. This feature is also triggered if the Moustache Boxer Wild appears in a diagonal position to the Bald Boxer Wild. If this happens then the Moustache Boxer Wild will punch the Bald Boxer Wild and the symbol directly above or below the Moustache Boxer Wild will turn Wild itself. A free spin, yes, still the single free spin, will then occur. 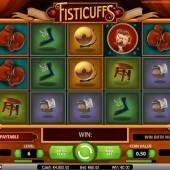 To be honest, Fisticuffs is a slot that flattered to deceive. NetEnt have released some top class slots in recent years such as the visually-stunning Evolution and the hilarious EggOMatic. However, Fisticuffs is a game that has fallen flat on its face. It’s not the worst game out there but NetEnt fans will definitely feel that this is a game that could have offered so much more.